Is there any anti-spam bot mod that will work with easyUCP? My forum is being attacked constantly and all of the captcha mods I have found edit large portions of the registration fields that have been commented out by the easyUCP mod. But I haven't found a single mod that doesn't interfere with easyUCP. 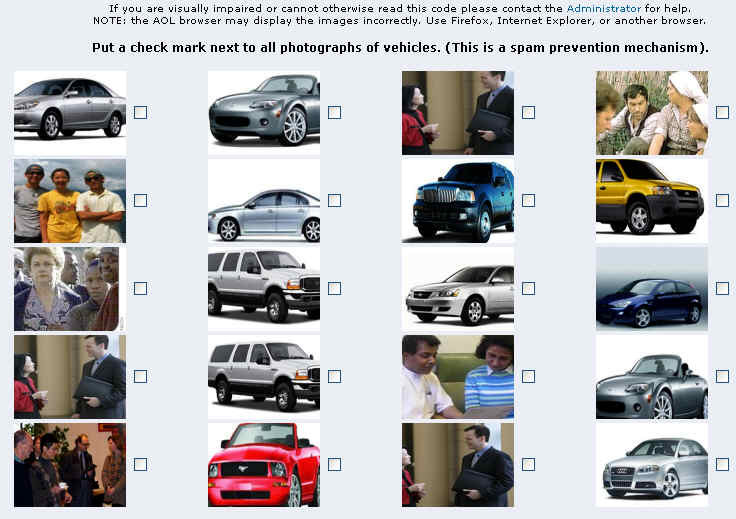 I dont know the "Photo-Recognition Visual Confirmation" but you can install all CAPTCHA MODs to the easyUCP. The registration fields that have been commented out are moved to an other place in the code. Few hires are easily changed but in particular its the same code. By the way. Do you know my AVC? Thats an powerfull CAPTCHA and very easy to install. I'll take a look at the "Photo-Recognition" now and there should be no problem to install. Possibly even together with my AVC. Uff - the MOD shows 20 pictures. I looked at your mod, and it too seemed to affect the commented lines. That was before I realized that the lines had been moved. The reason the photo recognition mod uses so many pictures is that it asks the user to select all of the pictures from a specific category, rather than force the user to decipher the difficult text captchas. I just have way too many spammers attacking my forum, so I'll look at your AVC mod too. Yes I have understood which the MOD does. But 20 pictures seems to be me a little much. With yours registration you saw the AVC in action. And I have no spam here. The Photo-Recognition is a nice idea. I only find 20 pictures really exaggerated! Ah - Here is a code to define how much pictures should shown. You're right. I looked at yours again and it's not bad. I'll give it a try and see how well it works. I am not sure what the equivalent code is in the easyUCP mod. Should I try the Photo Recognition mod I also have to replace the following in (ucercp_register.php). What is the equivalent code for this? The first code has no changes and is only moved by the easyUCP. Oh you have an very old code at this place. Take the attached file. It works perfect and you have no problems to install one of the both CAPCHA MODs. That worked for AVC. It would not work for the Photo Recognition Mod. I got one spam bot already, but I had turned the settings down a bit so humans could read it. I turned them back up and so far, no spam. That is very helpfully by configure the AVC.